Today’s ride is not a hidden gem. It’s a gem that is in plain view. 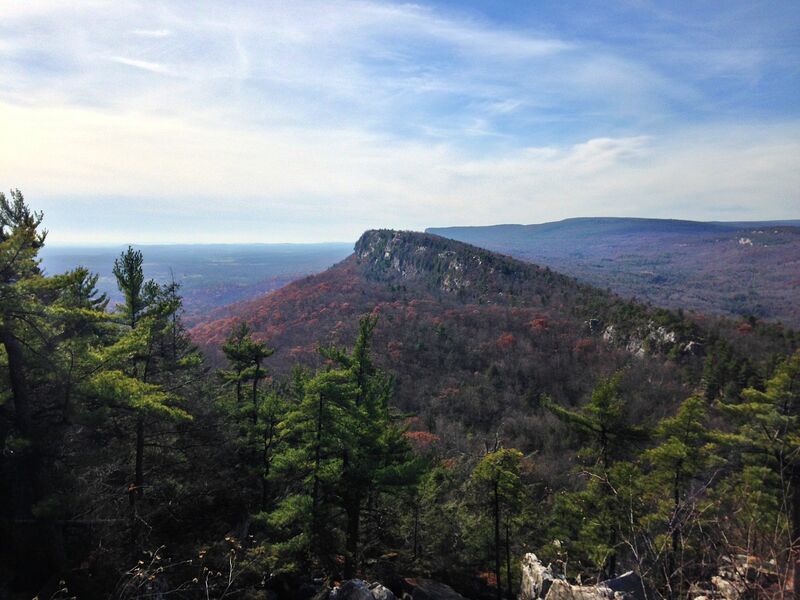 Between the Mohonk Preserve, Mohonk Mountain House, and Minnewaska State Park, there are thousands of acres of contiguous preserved open space, and over 100 miles of interconnected carriage roads and trails. Every inch is worth the trip. 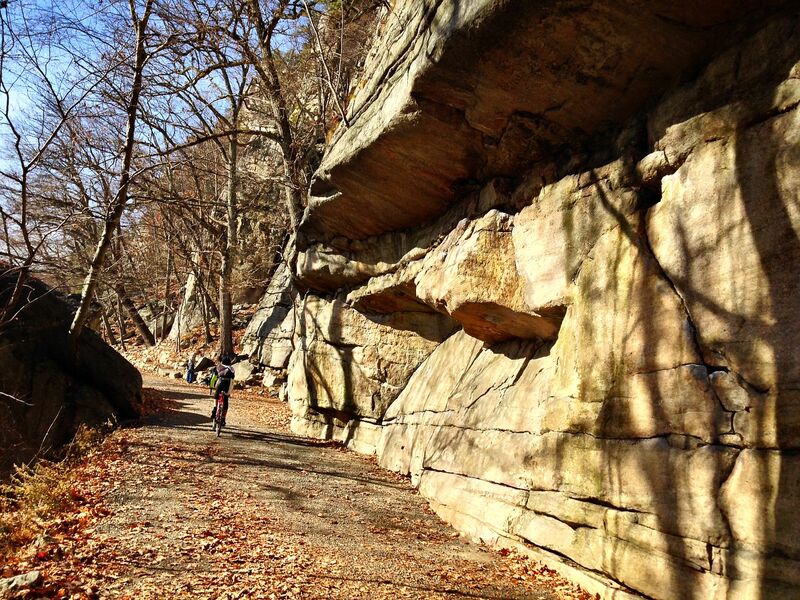 This is a popular tourist destination for cyclists, hikers, leaf peepers and rock climbers, so it’s hardly a secret backwoods passage. But even on a perfect late fall day like today, with sunny skies and temperatures in the 50s, we saw only a handful of people all day — a couple of rock climbers, a few hikers, and a couple of cyclists. 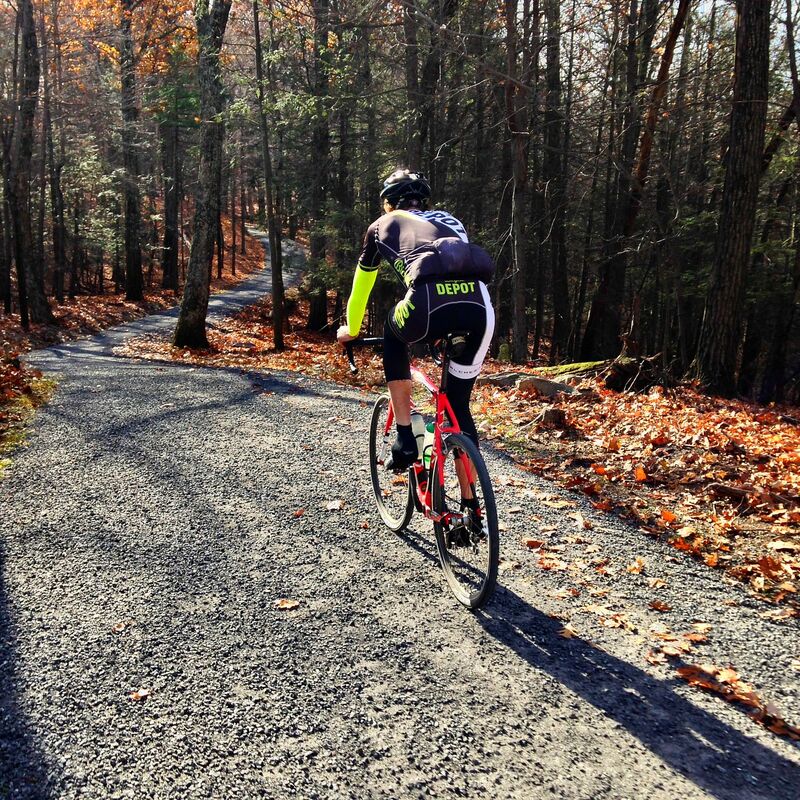 In the fall, I ride these carriage roads at least once a week, sometimes more. The Nature Conservancy called this area one of Earth’s “Last Great Places,” and although that may sound like a marketing pitch, it’s easy to get rapturous while cycling through the seemingly endless beauty. Depending on where you are coming from and where you want to park, this loop can be joined from any of the Mohonk Preserve entry points. We came in through the old Mountain House gatehouse (mile 1.5), which will soon be an official entry point, but we rode past four other official entries: the Visitor Center (mile 8), West Trapps (mile 8.5), Spring Farm (mile 19), and Pine Road (mile 26). 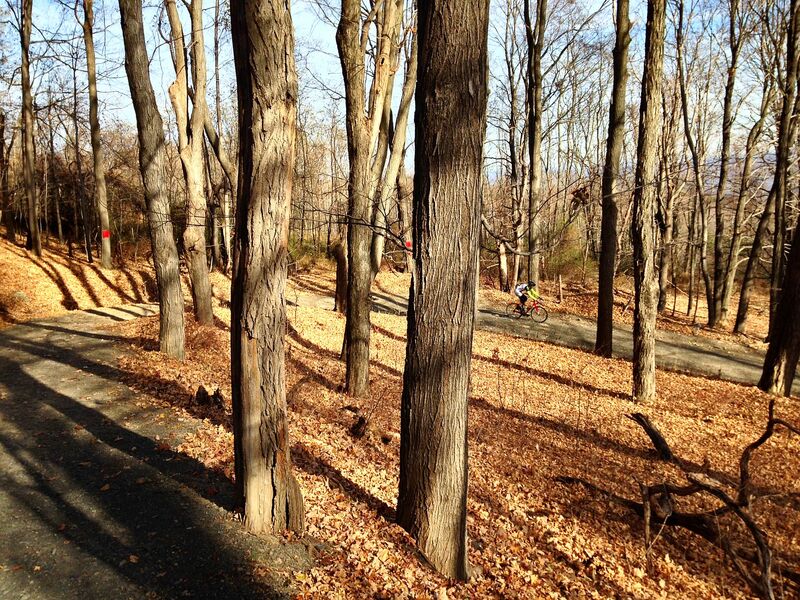 A bit of prep work first: day passes for the Preserve are $17 for climbers and cyclists ($12 for boring hikers). An annual cycling pass is $70. Trails are generally very well marked, but the free paper map given out at the various entries is useless. If you plan to spend any time in the backwoods here, the NY/NJ Trail Conference topo maps are a must. 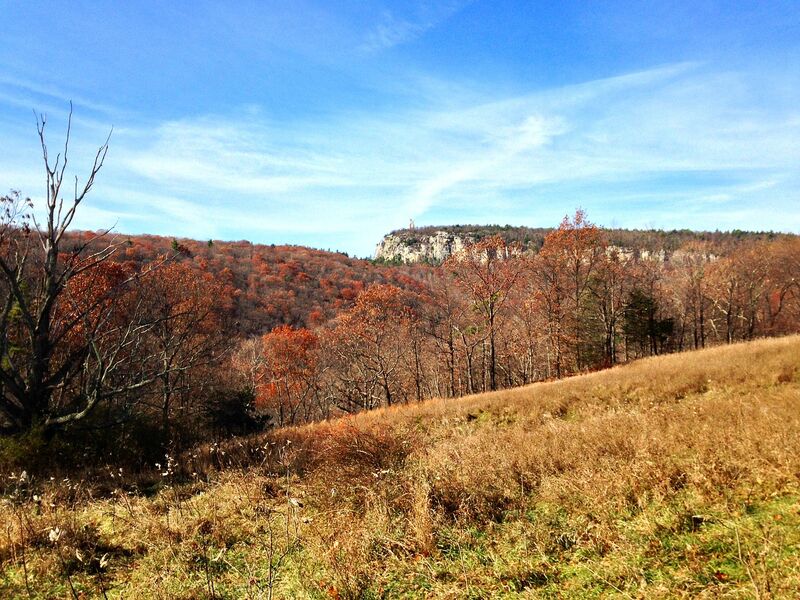 You can get the maps at the Preserve Visitor Center, or Rock & Snow in New Paltz. 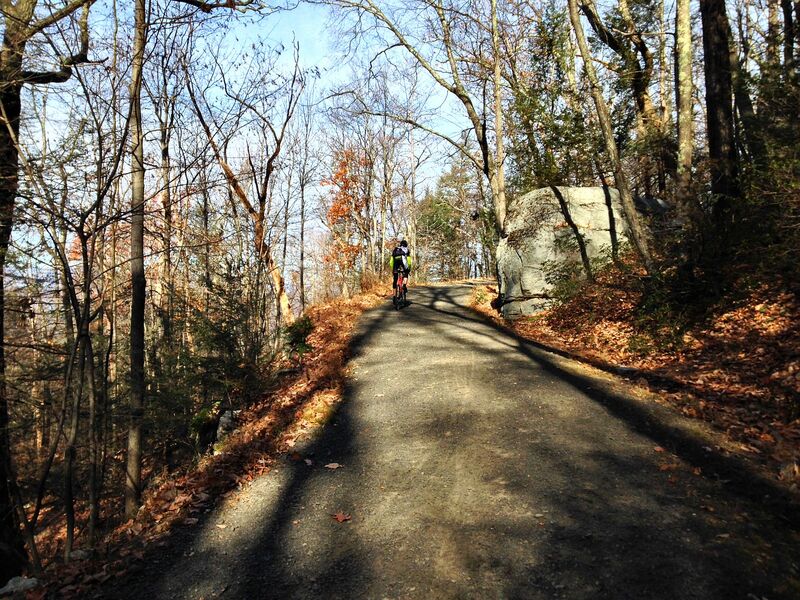 For today’s ride, we tried to hit all of the best, most scenic, most fun carriage roads in the preserve. Although there is plenty of singletrack gnar to be found around here, for the purposes of this blog and this route we stuck exclusively to carriage roads (except for one short connection). 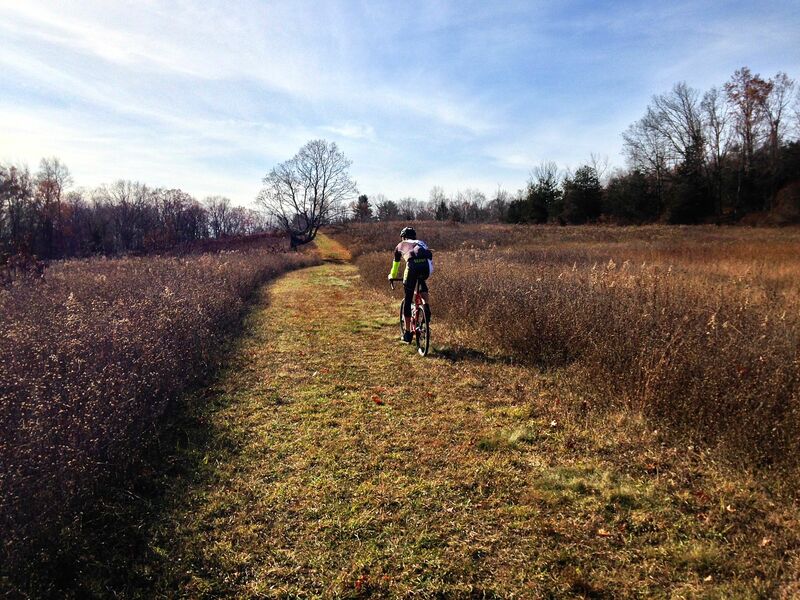 Just like we did on our previous ride, we entered the Preserve on Gatehouse Road. Over the old stone bridge across Butterville Road (where landscape painters tend to congregate), up Lenape Lane to the Catskill Aqueduct. The Catskill Aqueduct supplies about 40% of New York City’s famously high quality drinking water (no, “high quality” is not sarcasm), starting at the Ashokan Reservoir in Ulster County. Even in the preserve, the right-of-way over the buried aqueduct is New York City property, so you’re not allowed to hike or ride along it. But you can cross over it. It’s wild to be in the middle of the woods with 400 million gallons a day flowing beneath your tires, headed for sinks and bathtubs in the big city. 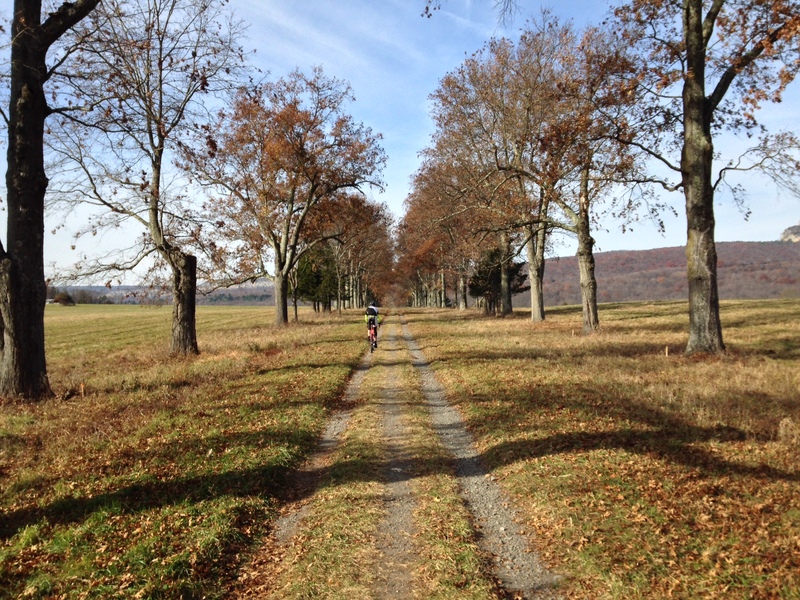 At the aqueduct, we cut left onto Duck Pond Trail, the only singletrack on the route. This is maybe 100 yards of rocky trail, climbing up to Duck Pond. 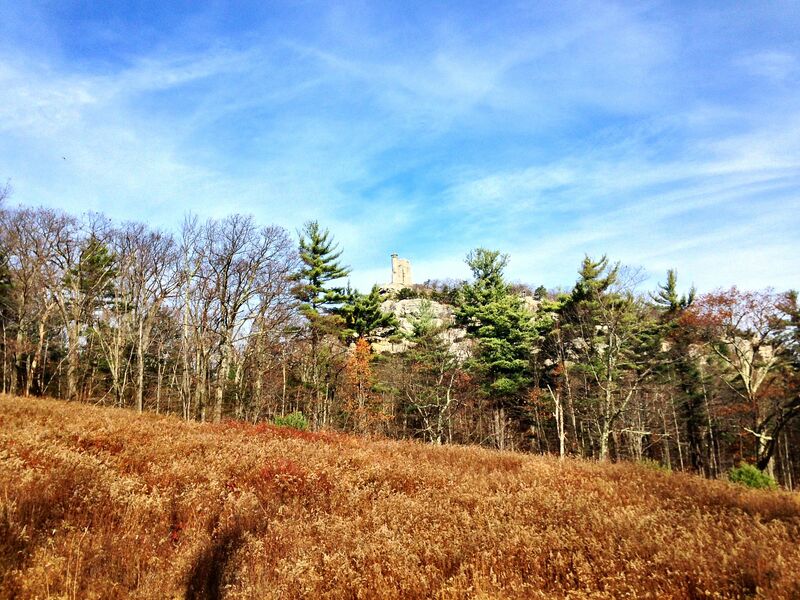 In the background, just visible on the left edge of the distant cliff, you can see Skytop, the stone observation tower above Mohonk Lake. More about the tower later. All trails lead uphill from Duck Pond. We headed clockwise around the pond, up Glory Hill, a steep grassy climb. At the top of the hill, we bore left onto Oakwood Drive. This winds along the side of the ridge to Rhododendron Bridge. Across the bridge, we took the sharp left onto Undercliff Road, which leads right along the base of the Trapps, a 2 mile long, 300 foot tall crag that is one of the premier rock climbing destinations in North America. On a summer day, the air is filled with “On belay! Rope! Aargh!” and other calls of climbers in their natural habitat. There were only a few climbers out today. 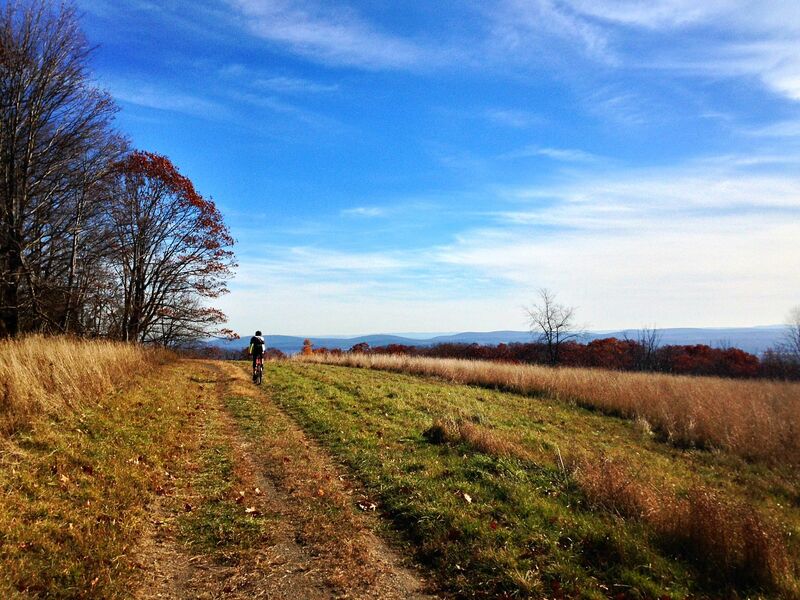 At the top of the trail, we hooked right onto Overcliff Road, which offers expansive views of Clove Valley and the Catskills. Although I am discovering that expansive views are about the hardest thing to capture in a simple photo. Overcliff looped us back to Rhododendron Bridge, where we once again took a sharp left, onto Laurel Ledge Road. This is one of my personal favorites, a steady 2-mile climb that winds up the ridge between giant boulders. The climb tops out at Copes Lookout and Humpty Dumpty Road, which winds along the edge of the cliff and provides a unique edge-on perspective to the ridge. 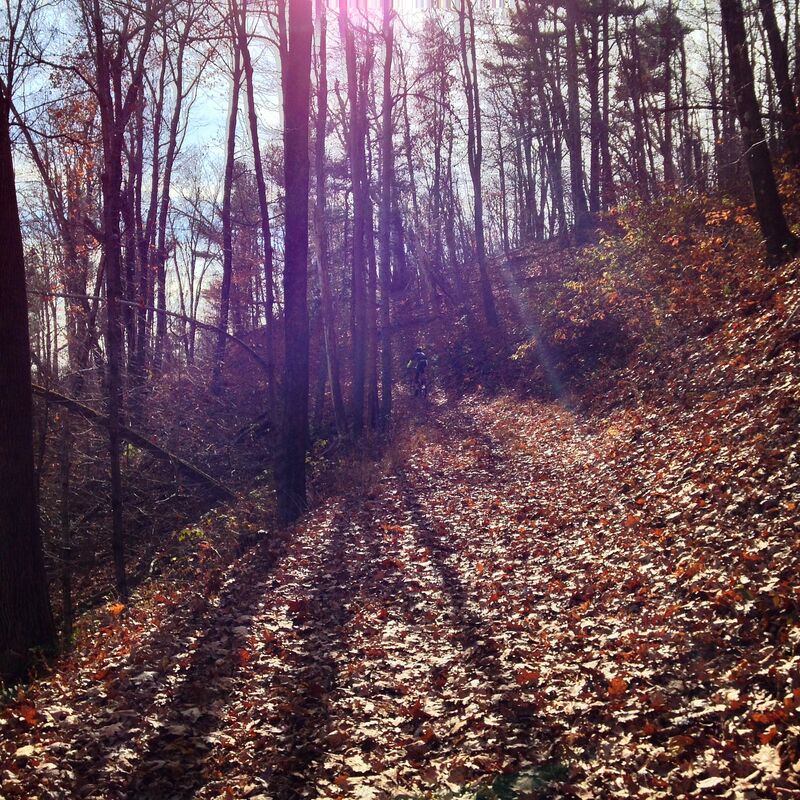 We then crossed over the top of the ridge on Long Woodland Drive, another favorite trail. Although it’s less than a mile from the Mountain House, this is one of the more remote places in the Preserve. We were circling the south end of Mohonk Lake, describing an arc around Skytop tower. 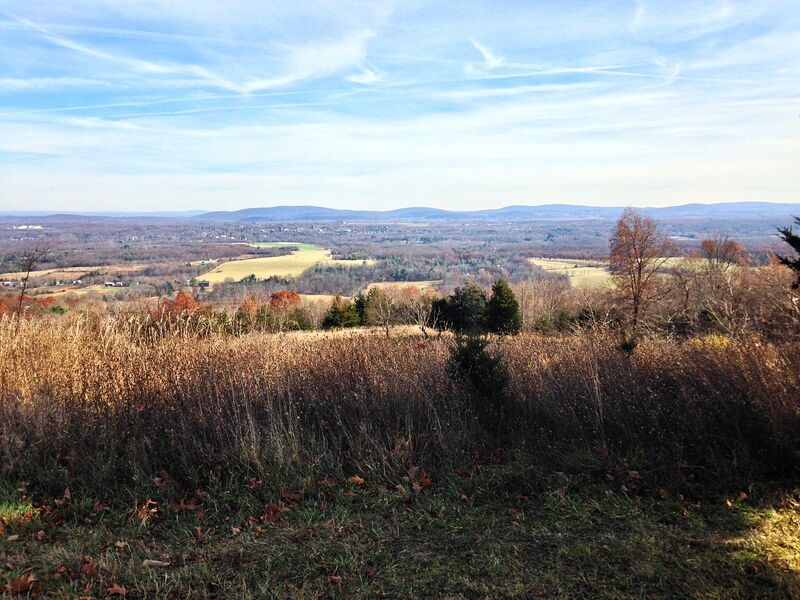 Skytop is a stone observation tower, atop on the highest point on this part of the ridge. Weather observations have been made here continuously and systematically since the late 1800s, forming one of the most reliable weather data series in North America, an invaluable resource for climate scientists. We then cut down to Home Farm Circle, the site of an old homestead that predates the Mountain House. Finally, some descending: we ripped down Forest Drive, then connected over to North Lookout Road. 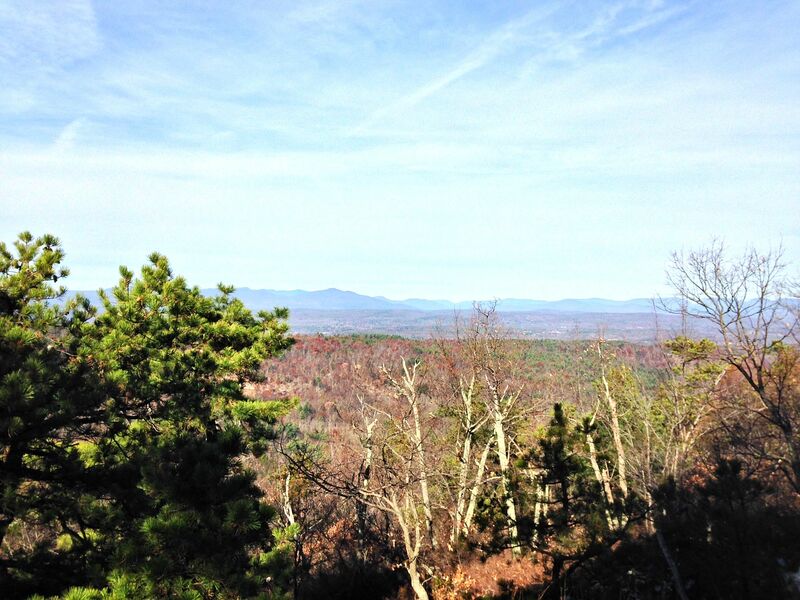 Yet another expansive view of the Catskills. We then hooked past Rock Rift, a wild out-of-the-way crevice full of trees, and down to Cedar Drive, one of the longest and best-maintained carriage roads in the preserve. This wound along the ridge to a small bridge over the main road. Cedar Drive continues past the Spring Farm entry point, circling back around to climb the ridge again for about a mile. The climb tops out at a 5-way intersection that is known unofficially as — wait for it — “the 5-way.” Left here leads to Bonticou Crag, one of the most interesting destinations in the Preserve. This photo shows only a small section of the crag, high above. If you are vertically inclined at all, the ascent trail up Bonticou is one of the most fun ways you can spend an afternoon. The difficulty level of this rock scramble is perfectly balanced right on the edge between “surprisingly challenging” and “doable without falling to your death.” I’ve seen 6 year old kids (including my own) scamper up like mountain goats, and I’ve seen grown men panic and back down the climb. It’s a 30-45 minute hike to this point from the Spring Farm entry. The whole experience is a top notch day trip. We then headed up Guyot Hill. This climb is one of the least-traveled roads in the Preserve, and in fact we almost blew past the turn because it was so deeply covered in leaves. This half-mile climb brought us to the highest elevation of our ride, although the views are limited because it’s woodsy all the way. From here it would be all downhill for the next 6 miles. The back side of Guyot Hill dropped us onto the Mountain House golf course, which is always a bit surreal, but of course it’s not in use in winter. We circled the golf course and crossed over the small wooden bridge to the Mountain House gatehouse, then shot down Lenape Lane, Oakwood Drive, and back down to Duck Pond. This section of the Preserve is rarely traveled. Back onto the short singletrack connector, which we followed out to the Pine Road entry. 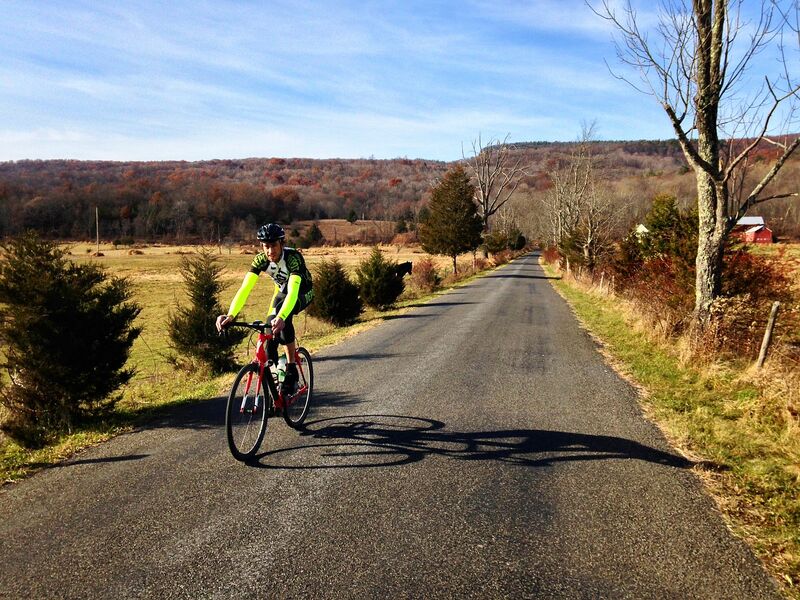 Pine Road descends past horse farms, heading back toward New Paltz. Spot the horsey! As we turned off Pine Road, we ran into Jim, a local legend who often rides with us. He was just heading up into the Preserve to start his ride. I said we were doing a Mohonk Greatest Hits ride, and of course he immediately asked if we did Godzilla or the Duck Pond Road climb. 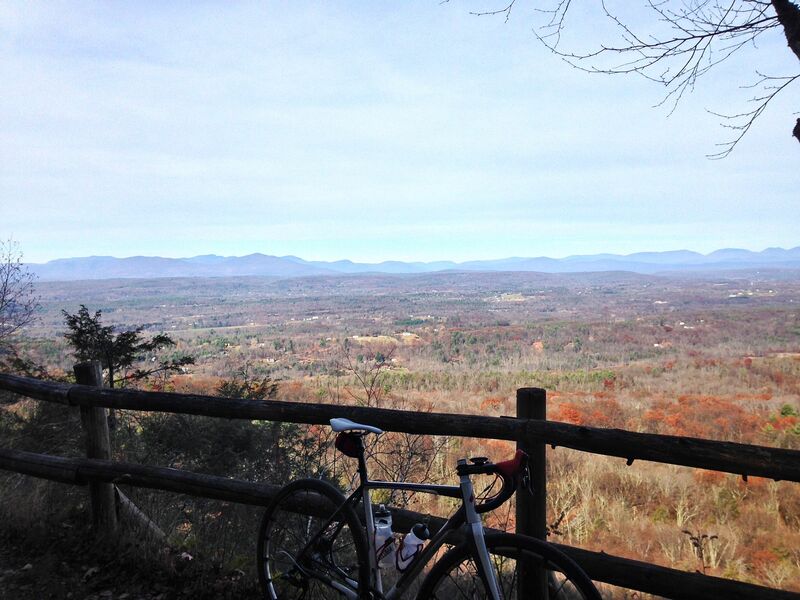 Well no, we didn’t do Godzilla (a very sharp climb straight up the ridge), and we descended the Duck Pond Road climb. So this route is hardly exhaustive. 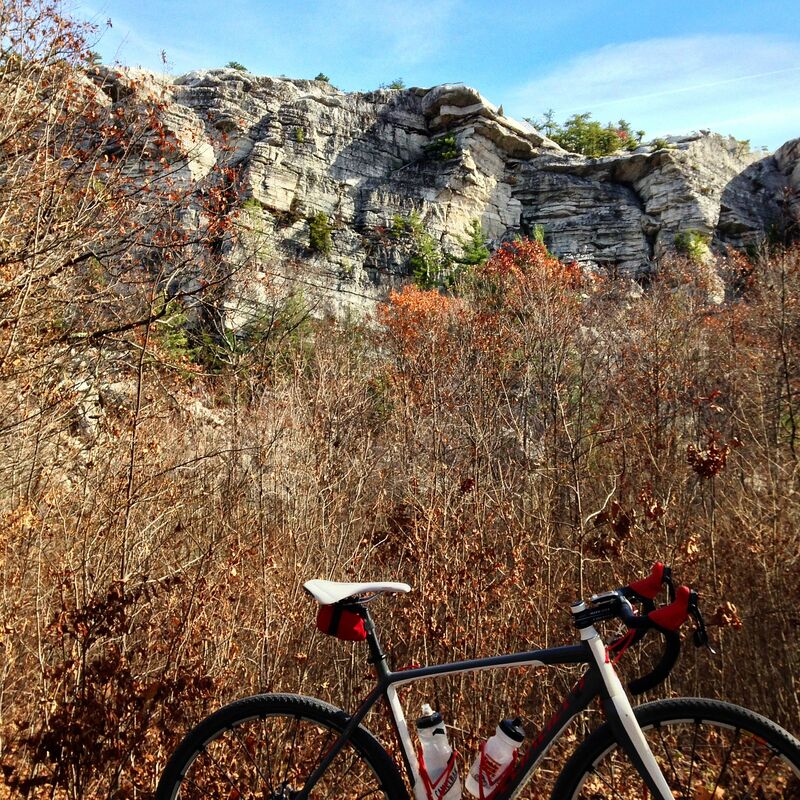 There are very few carriage roads in the whole Mohonk Preserve/Mountain House/Minnewaska network that wouldn’t be on somebody’s list of highlights. 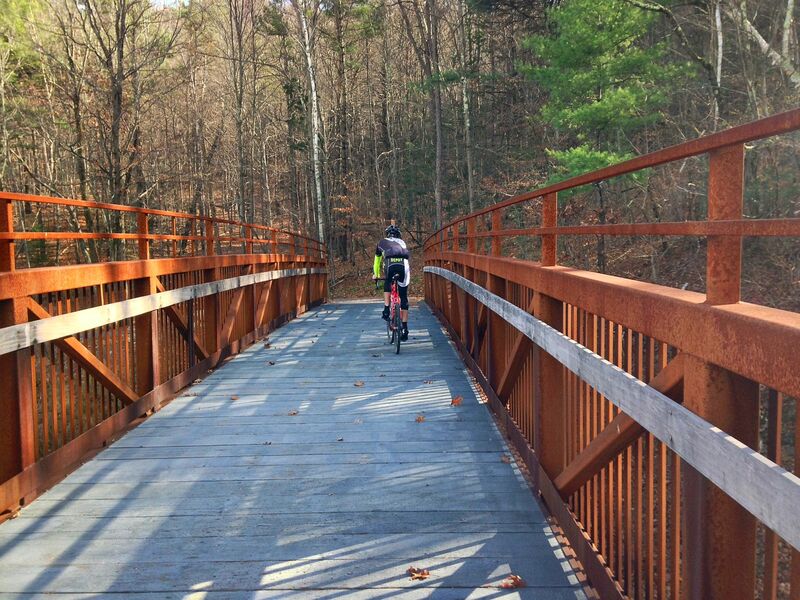 Depending on your predisposition, you might like to follow the route below, or you might just want to bike into the preserve and see where the spirit takes you. 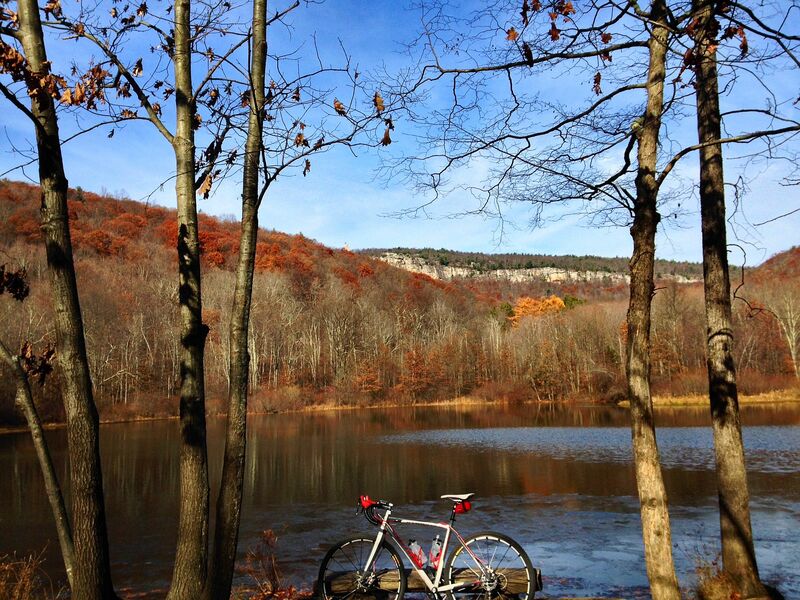 This entry was posted in bicycles routes rides, catskills, Worth the trip on November 16, 2013 by John Schwartz.